I went to Shima onsen at Gunma Prefecture with 4 people in my family. One of my colleagues told me that Shima onsen at Gunma Prefecture has fabulous onsen quality and its ryokan is wonderfully equipped. Although I was very interested in the ryokan, I could not have taken time to travel with my family. Yet there was a chance that my eldest daughter asked me, “What is onsen?” when she was watching the contents about Shima onsen at Gunma that was on air by chance. Then I decided to go to Shima onsen as 4 people in my family. Although the onsen travel was as short as three days and two nights, it became an unforgettable onsen travel for my eldest daughter and all of my family. We went to Shima onsen by a bus tour. The accommodation, Kashiwaya ryokan, was an old denominated wooden building with history. So my eldest daughter was very excited as soon as seeing the building of Kashiwaya ryokan. We separated into two groups, my wife and eldest daughter, and me and my eldest son, and took a bath at the large public bath. The scenery was mixed with Shima onsen’s nature landscape and cityscape. I could fully enjoy the atmosphere of Shima onsen with the taste of “This is onsen!” from the first day. After getting out of onsen, I was relaxed on a chair in the lobby, bought ice creams to children, and waited for dinner time, my wife and I drinking beer. The dinner was a course of specialty Joshu Beef. We enjoyed the mellow flavor with fat of Joshu beef while cooking thick steaks in front of the eyes. We spent three days and two nights at Shima onsen. I took onsen at least three times each day. And my bruises and sprains became quite well that had been chronically pain. I want to go to Shima onsen again with my family. 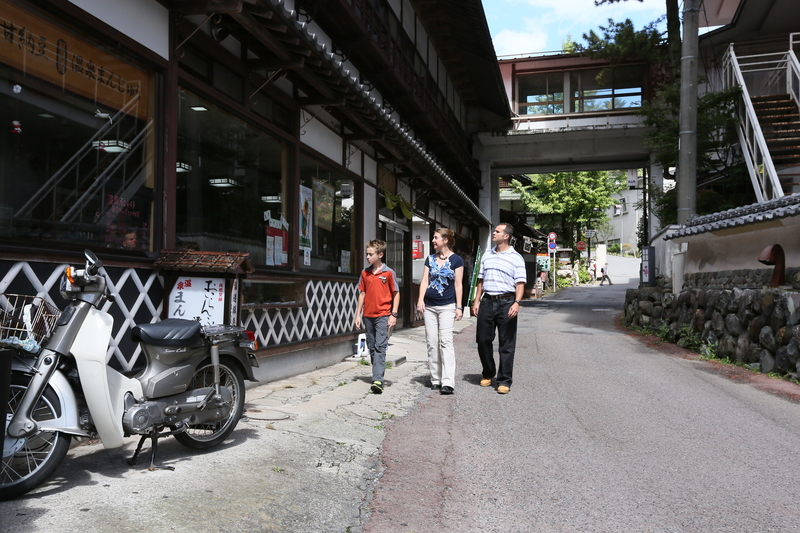 We sincerely thank you and your family for staying at Shima Onsen Kashiwaya Ryokan. We, the whole staff, are very happy to have been able to be of help in creating wonderful memories for you and your family. 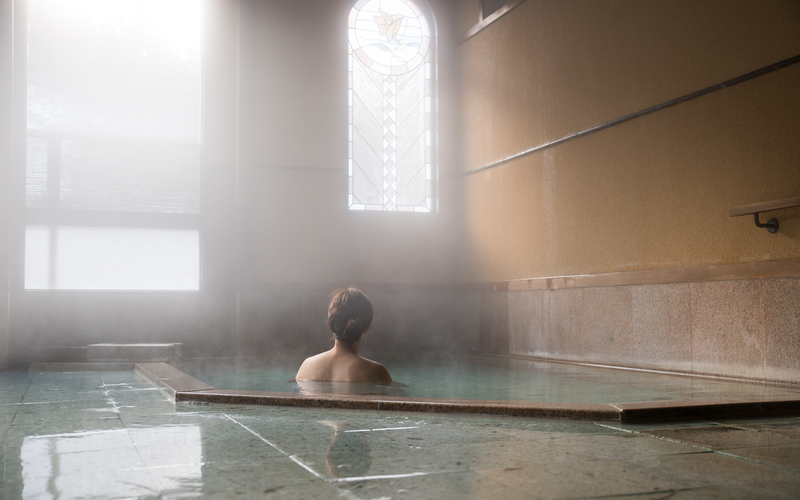 More than anything, we are glad that you leisurely enjoyed Shima Onsen’s surroundings, bathed in our hot springs many times and eased your aches and pains. 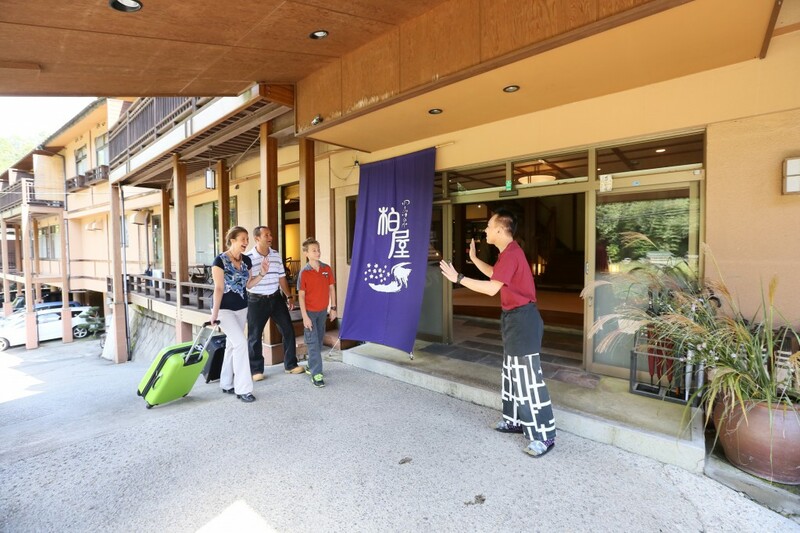 As your children grow, we will be more than happy if you could stay at Kashiwaya Ryokan at each milestone of your lives. We sincerely look forward to your next visit. Thank you. One of the benefits of taking onsen is “beauty effect.” Japanese onsen have been referred to as “hot water for beauty” from ancient times, wide range of age’s people from younger to older have been taking advantage of onsen as a part of skin care. The beauty effect of onsen has also scientifically verified. When blood circulation of body is improved by the thermal effect of onsen, discharge of waste is promoted and metabolism is activated. As onsen ingredients remove old cornified layer of skin surface, it is very useful to rejuvenation of skin. Moisturizing effect of water vapor is also excellent. It gives firmness and moisture to dry skins that tend to crack, so that you can get ideal skins. Above all, because all the components included in onsen are natural, thus the safety that there is no risk of side effects is attractive. Beauty effect level of onsen is not proportional to the number of bathing times. As soaking a high temperature onsen for a long time gives large burden on your body, take onsen only several times a day. Before going to an onsen place, have a light meal. As taking onsen consumes a large amount of energy, you may become ill if you take onsen when hungry. You should also have enough hydration. Before entering the bathtub, wash off the dirt of the body. Wash through sweat and grime of the body as well as makeup. 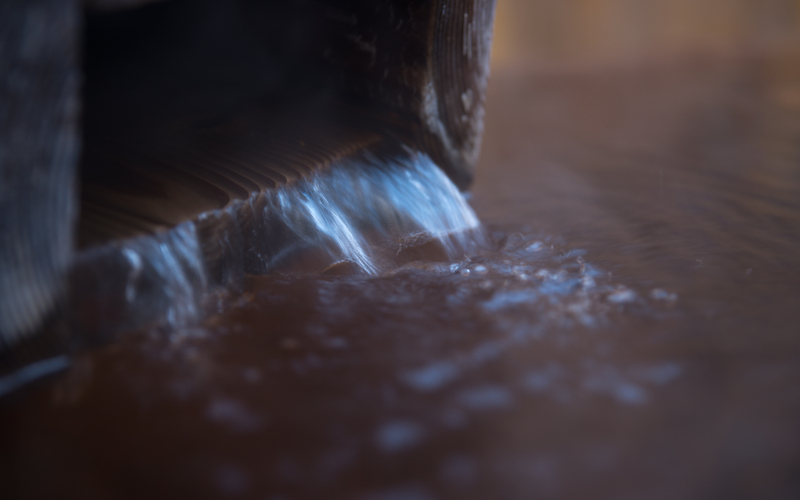 When you enter the bathtub while the body is still dirty, the precious onsen beauty ingredients do not penetrate into the pores. If you enter a bathtub with high temperature water right away, it will put a huge burden on the heart. First, scoop the hot water with Oke (scoop), do “Kakeyu (throw water)” several times on the feet. After the lower body is warmed up, do Kakeyu on the arms, shoulders, and back, and also warm the upper body. When the whole body is accustomed enough to the temperature of onsen, slowly enter the bathtub. Concerning the time soaking in the bathtub, it should be about 10-30 minutes at the longest. If you want to reduce the burden on the body, you may enter the bathtub in the following step; bathing → wash the hair → bathing → wash the face → bathing → wash the body → bathing… The “split bathing” lets you avoid the risk of continuously soaking in the bathtub for a long period. If you wash away the body before returning to the dressing room, the beauty ingredients on the skin surface run down. Those who still want to rinse your body before you exit, take shower lightly. Also, take a rest moderately and hydrate after bathing. Shima onsen is the efficacy rich onsen that is said it works on the 40,000 diseases from the old days. By taking onsen with plenty of time, you can heal the daily fatigue and it gives beauty effect on the skin. When you bathe in onsen, please try these points by all means. In general, ryokan rates includes meals fee, too. If you stay over a night, ryokan prepares the dinner on the day and the breakfast on the next day. Thus you can save your time to prepare food by yourself. It cannot be an exaggeration if I say that meals at ryokan are one of the best parts of travel. You can fully enjoy a wide variety of delicious cuisine washoku with abundant seasonal local ingredients to Western with fruits and main meat dishes. You can enjoy the service only at ryokan that taking onsen with a plenty of time, warming up your body, and enjoy delicious meal. Your feeling must be raised in front of lavish meals, such as you cannot eat everyday. You will be released from the stress of everyday life and spend the bliss of time. It should be noted, menus and catering ways served at ryokan vary greatly by each ryokan. If you are interested in tuna, saury, chestnut, nuts, and foods of mountains, ryokan in mountainous areas is recommended. In order to fully enjoy onsen travel, you can be more enjoyable if checking what kinds of meals are served as well as onsen. We, Kashiwaya ryokan, basically serve “Kaiseki Ryori” that is a kind of full course among all the Japanese foods and arrange so that modern customers and younger customers can also enjoy. In addition, although Kaiseki Ryori tends to serve lots of amount, we are committed to serve reasonable amount. For menu that changes about 5 times a year, we cook them in gentle taste. Kaiseki Ryori is hospitality dishes to enjoy drink. The basic menu is one soup and three dishes (soup, sashimi, grilled, and boiled), side dishes for sake are added, such as Otoshi (appetize), steamed food, marinated, vinegared dish, and finally rice, miso soup, pickled, and fruits are served. After taking efficacy rich Shima onsen that is said to work on 40,000 diseases with plenty of time, enjoy tender Washoku with lots of local Gunma fresh vegetables and utilized bonito soup that is totally unique in Japan. Except ryokan in urban areas of Tokyo and Kyoto, the basic Japan ryokan accommodation system is one night two meals (Half Board) with dinner and breakfast. In recent years, including our Kashiwaya ryokan, more and more ryokan are accepting other styles, such as B&B, accommodation and breakfast, and just sleep over. However, if you’re staying in long-awaited Japan, I recommend that you eat both dinner and breakfast at ryokan at least once. This is because ryokan is the perfect place to taste “Washoku; the Japanese Traditional Food Culture” registered as the UNESCO intangible cultural heritage. However, a lot of ryokan provide in buffet style at relatively large-scale ryokan, so you need to be careful. Of course, I do not deny buffet style, but this is from a point of view in order to taste “Washoku; the Japanese Traditional Food Culture” registered as the UNESCO intangible cultural heritage. 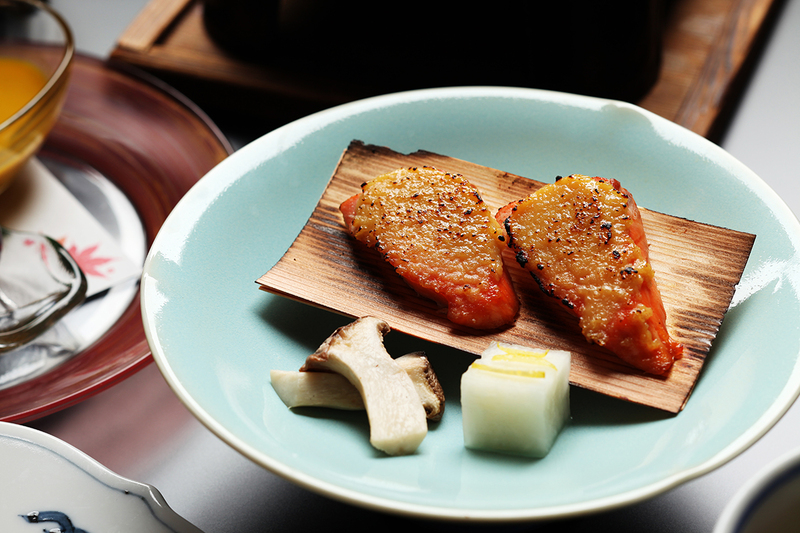 What is Kaiseki Ryori (traditional Japanese meal brought in courses) ? 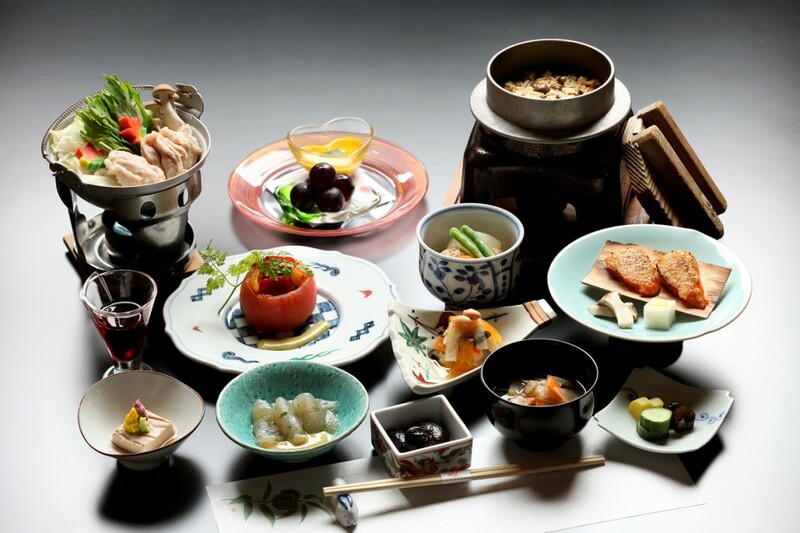 Most ryokan have their base of dinner as washoku, and many of them have the flow of “Kaiseki Ryori.” Kaiseki Ryori was originally dishes to enjoy drink and consists of various side dishes for sake, such as soup, sashimi, grilled, boiled, fried, steamed, marinated, and vinegared. Then it has a style of rice and soup (Tomewan; finish bowl) coming up at last. There are versatile ryokan; some ryokan serve traditional style of Kaiseki, some provide a little simplified, and some arrange in Western-style. 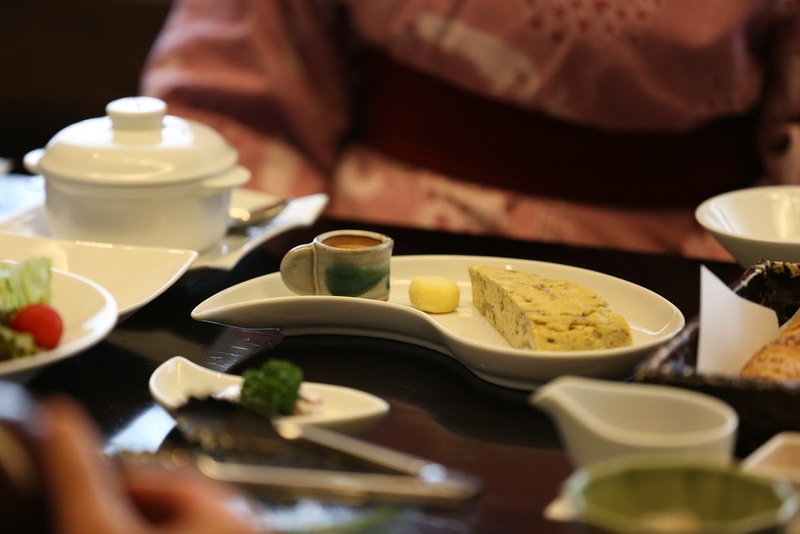 In addition, there are also ryokan, which serve “Kaiseki Ryori” that has same the reading but different kanji and has its roots in Teaism to enjoy tea and “Shojin Ryori (vegetarian food)” that does not use meat and fish. Breakfast has more wide variety depend on each ryokan. Some ryokan serve feast more than enough to eat all even at dinner, some serve simple and basic one soup and three dishes, and some serve Western style as selected like our Kashiwaya ryokan. There are also many ryokan, which serve in buffet style only for breakfast. Dinner at our Kashiwaya ryokan has the basic of “Kaiseki Ryori” and is arranged so that modern customers and younger customers can also enjoy. In addition, although Kaiseki Ryori tends to serve lots of amount, we are committed to serve reasonable amount. For menu that changes about 5 times a year, we use local ingredients from Gunma Prefecture, where lots of fresh vegetables are available, and cook them in gentle taste that takes advantage of bonito soup unique to Japan. For breakfast, you can choose from Washoku, which has lots of local ingredients, such as local miso and tofu, and Japanese rice gruel, Washoku with freshly baked bread and coffee, or brunch at Kashiwaya café at onsen town. “Food” is one of the great funs of travel, so please fully enjoy. Although the topic is concentrated for women if I say “beauty,” even men can spend comfortably every day if they are in good physical condition and have fine skins. As I wrote in the article of Effectiveness and Efficacy of Onsen, it is said that onsen has 5 effectiveness and efficacy. “Changing environment effect” by changing environment. It has been found that Japanese way of taking bath consumes significant energy. For example, when you take 42 ℃ onsen for 20 minutes, it is said to consume 220Kcal. It burns your calories as much as light jogging. That means, there is a diet effect! 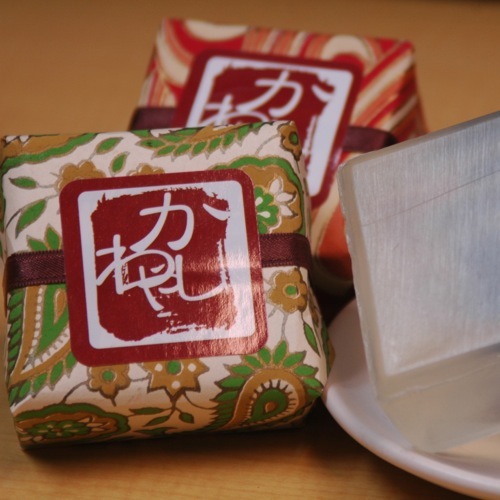 Quality of Shima Onsen is “sodium-calcium chloride, sulfate onsen”, which main components are sodium chloride, calcium chloride, and sulfate ions. As it contains abundant sodium ions, you can taste little salty with a little lick. When taking onsen, a large amount of sodium chloride components cover the body like a veil, and bring perspiration like sauna. Sulfate onsen has power to discharge waste and metasilicate gives moisturizing effect, thus you can enjoy the efficacy to become moisture beautiful skin that is eternal yearning of women. Perhaps, relaxing is the best for beauty. The best part of trip may be relaxing in an unusual location and environment away from distractions of work and everyday matters. Starting with Shima Onsen, many Japanese onsen are located at scenic place full of the nature, thus changing environment effect is especially outstanding. 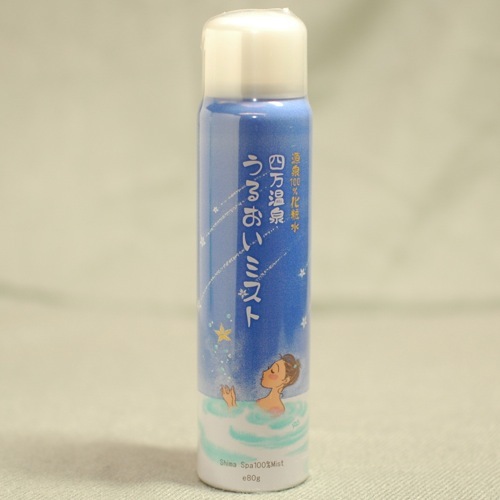 As Shima onsen is said to be good for beauty, beauty products, such as lotion using onsen, are also sold. For example, there are “Shima Onsen Moisture Mist,” lotion with 100% onsen component, “Shima Onsen Soap” with onsen kneaded, and “Wet Tissue” made of onsen water. Not a few customers also repeatedly purchase them. 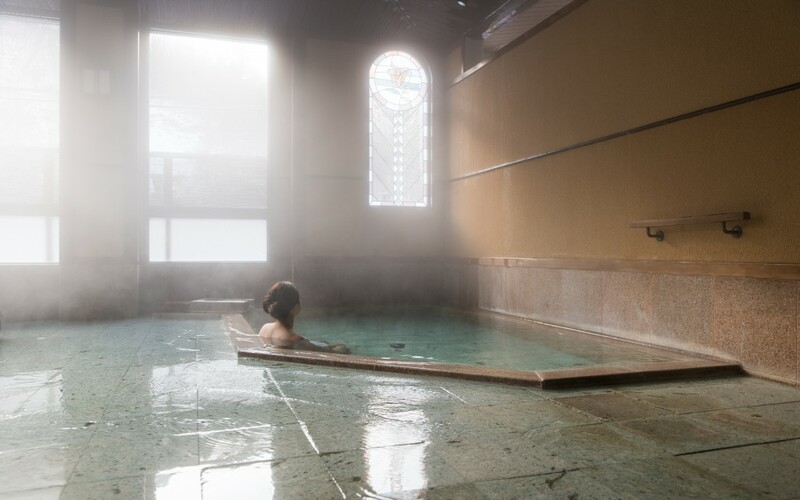 Shima onsen is efficacy rich onsen that is said to work on 40,000 diseases from ancient time. It is wondering that, with even through one night, your head is cleaned, skins become shiny, your physical condition becomes better, and your feeling becomes gentle by fully enjoying the onsen. Finally, you have to keep this in your mind. Although it is said onsen is good for beauty, “the last drop makes the cup run over” as in the proverb. If you take hot water too long, so-called hot flashes, anemia, and dehydration may occur. Get used to hot water gradually and do not forget hydration! 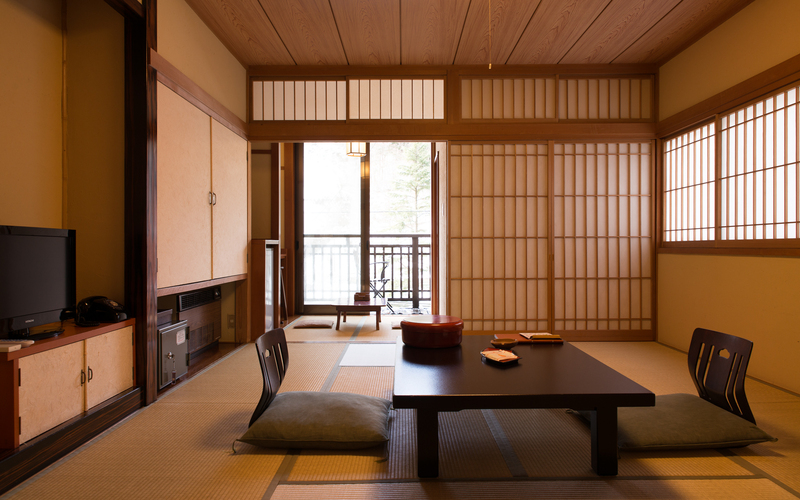 Including ryokan, there are unique rules and manners in Japanese houses and buildings. Here, I am going to introduce them in the time series from check-in to check-out. If you will stay at ryokan with dinner, arrive by around 18:00 at the latest. This is because a lot of staff, such as Itamae (chef) and Nakai (waitress), are waiting for you looking forward to be able to serve the cuisine at its best. If you will be late, please contact ryokan in advance. Now, you arrived at the objective ryokan. Here you might be confused first whether you take off the shoes. In traditional Japanese ryokan and Japanese house, we take off shoes at the door and become bare feet or wear footwear for inside. However, many recent ryokan take style to enter wearing shoes. In addition, it might also be hard to tell whether you take off shoes in some cases. (Even Japanese sometimes be confused.) In such a case, do not hesitate. Ask the ryokan staff on the spot. In the case of long-term travel, your luggage will become absolutely large. Thus most people may use bags with casters. Yet, be careful here. As the floor of Japanese architecture is very delicate, If you carry your bags in your hands without rolling casters(Of course our staff will take care of your large baggage). It will make you be welcomed as a guest with one rank up manners. Also, you carry your luggage by yourself to the room as far as it is not so large. While carrying, when they open doors or arrange your footwear, say “Arigatougozaimasu.” This one concern will let you achieve communication. Japanese room’s floor is covered with Tatami. Tatami is a traditional flooring used in Japan and is a rectangular mat of about 1.8mx 0.9m with a core made of compressed rice straws and Tatami-omote, made of Igusa, a kind of grass, wrapping around the core. This Tatami are laid over rooms at most ryokan. It is said that there are more than 3,000 onsen with accommodation in Japan. In addition, its history and traditions are also great. A relationship between Japanese and onsen is so deep that there are descriptions about onsen on “Kojiki” that is said to have been compiled in A.D. 712 and is the Japanese oldest book. 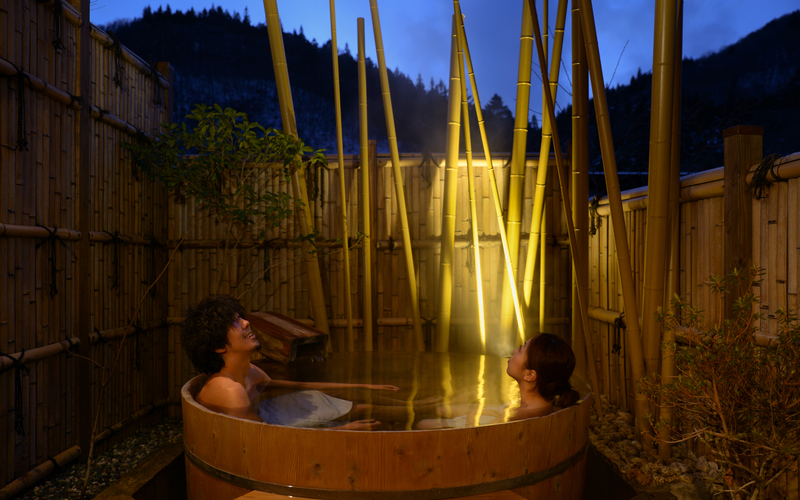 We often say, “Onsen culture is due to Japanese DNA.” It is exactly like that. Where is the oldest onsen in Japan? Onsen enthusiasts often discuss it. From a view that are appeared in the ancient texts such as Nihonsyoki (Chronicles) and Fudoki (Topography), commonly referred “Japanese three oldest onsen” are Dogo onsen (Ehime Prefecture), Arima onsen (Hyogo Prefecture), and Shirahama onsen (Wakayama Prefecture). In the era when medical care was undeveloped, onsen was revered as Holy Land that has amazing efficacy for injury and illness. It was after the Kamakura era that bathing became a common culture same as modern. Then in the Edo era, “Toji (onsen therapy)” culture, that is people heal their fatigue in onsen during agricultural off-season, spread and has continued unbroken until now. Tradition of Shima onsen is also very old and nobody knows exactly, however, there are episodes, such as Shogun of the time, Sakanoue no Tamuramaro, discovered it at Ezo conquest during Enryaku period (from A.D. 782 to 806) according to a legend, and Usui Hyuganokami Sadamitsu, a vassal of Minamoto no Raikou, discovered it when traveling From Echigo country to Ueno country in Eien 3 (A.D. 989). The legend is like this. Usui Hyuganokami Sadamitsu was spending time by chanting while he was camping in the middle of the journey. Then suddenly, an unfamiliar child appeared and left mysterious surrender, “I bestow you a holy onsen that cures 40,000 diseases as I was moved by your sincerity of chanting. I am a divine spirit of this mountain.” Although Sadamitsu was almost falling asleep, he examined the peripheral in a hurry, and found onsen gushing out there. According to these legends, it is likely that onsen had been known before the 10th century. It was during the Warring States Period of the 16th century when Shima onsen ryokan was full-fledged open. The length of history is also a proof of the height of efficacy. It is said that when taking Shima onsen, it demonstrates wonderful effects on improving skin diseases, such as atopic dermatitis or burns, and poor physical condition of gastrointestinal system disease. Thus, Shima onsen is highly acclaimed as a premier Toji place. In addition, skin effect is also outstanding, thus many female customers also visit for cosmetic purposes. 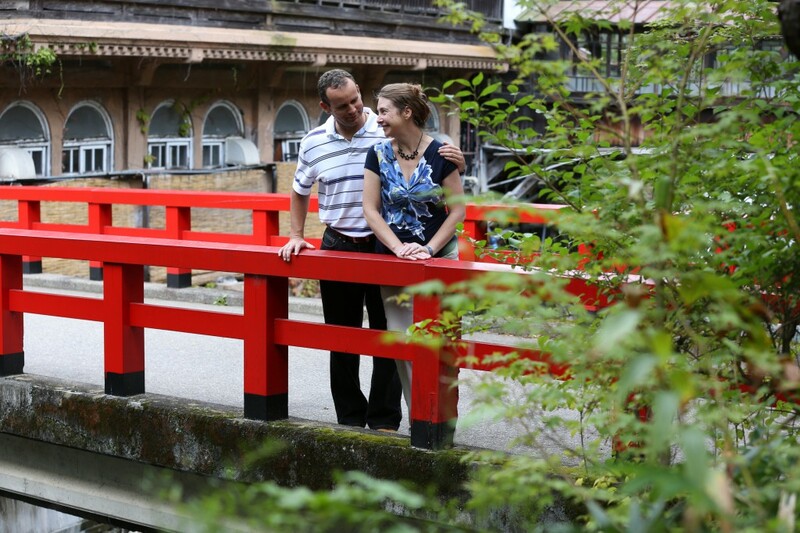 Shima onsen is a spa town, and there are more than 30 accommodations along Shima river. One of them is “Sekizenkan main building,” which is said to be the existing Japanese oldest Yuyado architecture. So, you can feel good old Japanese tradition. Sekizenkan is said to have become the model of the stage of “Spirited Away,” a Studio Ghibli’s masterpiece. If you look at the red bridge towards straight extending to the front door, many people raise impressed voice by superimposing with the world of the anime. In October, a Shima autumn festival is held, where local young people play grand festival music works together. The traditional festival lives up the onsen town, so you can enjoy a little bit different Shima onsen’s taste from usual one. 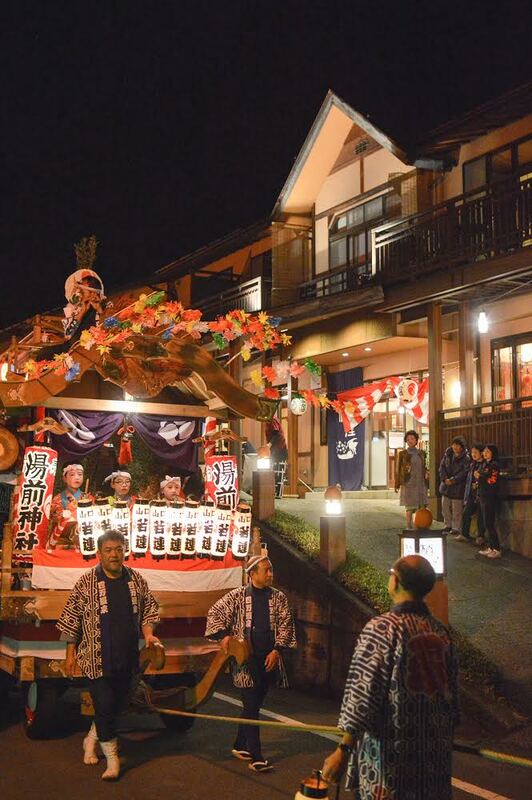 “Yakushido,” a national designated important cultural property, that has been dedicated to Yunomae Myojin at Hinatami district is a symbol of Shima onsen tradition. It is said to be architecture of late Muromachi Era. The fact that there was such a splendid building from that time is also a testimony that Shima onsen has prospered from old time. There is a system called “national resort onsen,” best onsen as resort designated by the Ministry of the Environment, in Japan. Shima onsen was designated as the first national resort onsen in 1954. 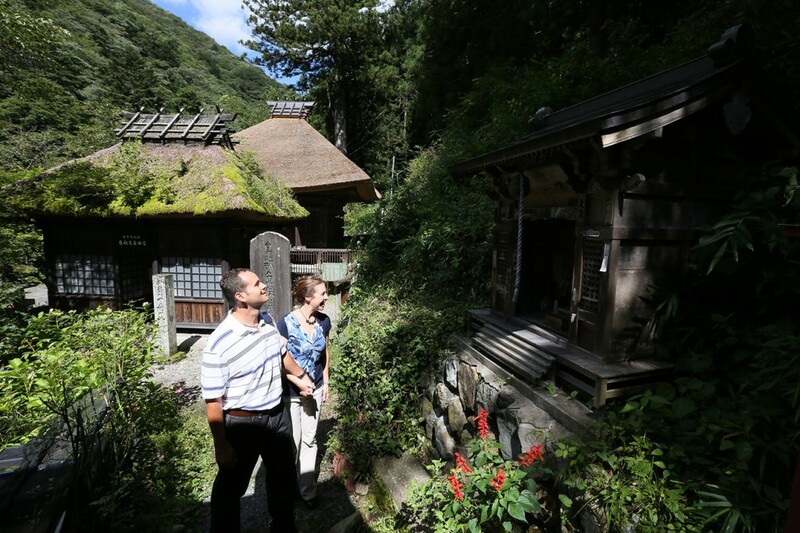 This would show that Shima onsen is traditional and also has excellent medicinal efficacy. As Toji culture had been remained until the 1975’s at Shima onsen, you can walk the streets where you can feel the Toji culture even now, such as shopping mall and drinking onsen spot. In addition, concerning the humanity of people living at Shima onsen, most of them do not care business profit that is same as in Toji era, thus people sometimes say that it is like the time of this town has stopped. Fully enjoy onsen atmosphere at traditional Japanese onsen, especially among them, at Shima onsen with old history.